...so why not add some color and a little whimsy to your treats. As of the end of February / beginning of March, it is decidedly still winter in our neck of the woods (literally) here in Nagano, and I feel amply justified to do a post about winter foods at this point of the year. Well, perhaps not amply. Okay, not at all. But like the last time, I will attempt to defend this not entirely well-timed piece of blogging with that time-honored dictum, namely: "better late than never". If you happen to have read my last post even if only for the first few paragraphs, you would know how I went on and on and on about my love and appreciation of fresh produce, particularly fruits, that are available here in Nagano, how I threw myself into the world of making tarts (and tartlets) of all sort using all those gorgeous fresh fruits of the season (which, in the case of that post in question, was autumn), and how I found it fascinating to try different types of tarts and ingredients as I baked my way through over the period of a few years. So I skip that introductory part here, and get straight to the point: tarts. Lots of them, all made with fresh fruits of the season: winter. Well, most of them. Due to the fact that there are very few fresh fruits that are seasonal in this cold countryside where green markets are all but half asleep, if not completely closed down, until it becomes warm, the kind of fruits you get to use are often those with a long shelf-life (i.e. picked in late autumn and stashed away for long-term storage) or else come from somewhere warm, where things grow and ripen even in the middle of the winter. 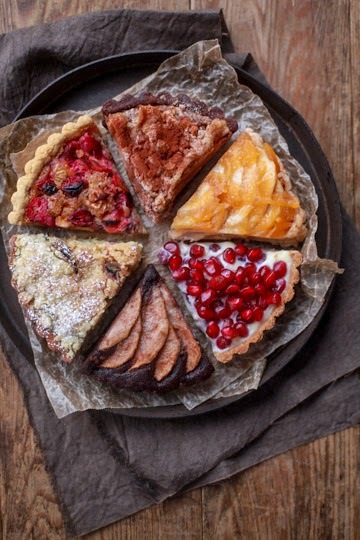 So in a sense, what follows is not so much a collection of tarts I made with winter fruits as that of tarts I made with fruits in winter, if you know what I mean. As a shower left the place covered in fog. I wrapped up my autumn tart post with apple tarts, and said you'd find a lot of them in the then-yet-to-come winter post as well. I thought that'd be inevitable; apples, after all, are the only fruit you can actually find at our local green markets (those that are open, that is) from around December through March or even April. Apple tarts for days, I thought. As it turned out, that wasn't the case. By mid December, the only decent apple you can get is Fujis, and come January that's the only apple you can get, decent or not. Truth be told, the apple isn't my most favorite fruit in the first place, and I am extremely picky about apples; I know exactly what I want with them - crisp, firm, and juicy. And the kind of apples you can get for the most part of the year simply aren't up to scratch by me. At least not for snacking. In reality, we almost always find ourselves with a stock of apples throughout the winter, so I do use them every now and then, cooking some into hot cereal or baking cakes and tarts. Apple tarts with dried figs and apricots. This was a variation on one recipe that I've been going back to time and again, from How to Be a Domestic Goddess: Baking and the Art of Comfort Cooking by Nigella Lawson (Hyperion, 2001) (US edition). The original recipe, which I've tried and loved, is called Black and White Tart, a stunning thing that consists of a crust made using graham crackers (or more precisely, digestive biscuits), a tiramisu-like mascarpone cheese-based cream, and a heap of fresh blackberries and white currants. And the Domestic Goddess herself noted that you could use all sorts of fresh fruits of the season, and even dried fruits in the winter; so I took a cue and did just that, by adding some wine-poached apple slices and a handful of toasted walnuts. Worked totally fine. Apple raisin galette with Calvados. I've been having great successes with galette recipes from Chez Panisse books and this was of them, from Chez Panisse Cafe Cookbook by Alice Waters (HarperCollins, 1999) (you can find the pastry recipe online, here). The original recipe uses currants rather than raisins (thus called Apple and Brandied Currant Tart), but I didn't have the former lying around so just used the latter. Both the apple slices and the dried fruit got tossed with Calvados, which gave the tart a wonderful aroma. Another lovely addition was a syrup you make using the apple peelings and cores, that takes up a beautiful color and flavor as you splash it over the finished tart. Apple berry almond tart. A partially baked crust gets smeared with a berry jam (I used a raspberry one), scattered with some berries for a good measure, then filled with an almond cream loaded with diced apple. This almond cream is a lighter sort compared to the type commonly used for tarts, but the tart was by no means bland, thanks to the mix of flavors and textures. You can find the recipe here. Also with layers of flavors and texture was this apple marmalade tart, combining two of the great classic winter fruits: apple and orange, the latter in the form of marmalade. As natural a combination this may seem, it wasn't something I grew up with; I first came across a recipe for a tart that combined apples with marmalade as a teenager (which is a looooong time ago) in a large Japanese book focused on British baking, and I have always associated this pairing with Britain, and the recipe I used here is also an English one. Here you have your apples in two ways; cooked down to a chunky puree, and sliced. The marmalade (homemade here) comes at the very end, covering the baked tart entirely and generously. It was very rustic tastewise but looked oddly sophisticated. For the crust I used a vegan recipe from another source, making the tart almost vegan - almost, because I'd made the marmalade with honey. I adore good apple tarts, but many of them seem to come out more or less similar. Nothing wrong with that, but still. Pears, on the other hand, have the remarkable ability of getting on well with all sort of ingredients, including chocolate (with which apples never seem to pair well). This I think helps the fruit find its way to a wide variety of tarts and other baked goods. Now pear aren't what you'd think a winter fruit, I know. Like apples, though, late harvest varieties are around until December or so. And they keep longer than most other fresh fruits, well into early to mid winter, giving you an alternative to apples to bake with. Pear and grapefruit tart is one of the things I remember seeing at some of the pastry shops in Paris, and although the combination wasn't a one I grew up with (largely because Western pears weren't a ubiquitous fruit back then), it quickly became one of my favorites once I tried some. This was a recipe from Eric Kayser's tart book, Les tartes d'Eric Kayser (Flammarion, 2006), where it is called Tarte aux Poires et aux Pamplemousses. A simple yet splendid combination of a pate sucree dough, an almond-pistachio frangipane, and slices of pear compote and grapefruit sections creates an instant classic. As I mentioned, this recipe combined almonds (ground) and pistachios (paste) for the cream. The pistachio paste I used didn't have a coloring used in it and didn't quite have a vivid green you'd associate with the treasured nut, but the tart tasted splendid. Made me miss Paris though! Then I made the same tart again, but swapping ground almonds with pistachios - making it a 100% pistachio tart (with pears and grapefruit, too). The pistachio green shines out a little more, perhaps? Whether with pistachios alone or combined with almonds, the tart was a winner - and I so adore the sweet and creamy-textured pear and the tart and refreshing grapefruit. ...Say, chocolate? The choc-pear pairing is extremely popular, and rightly so. There are any number of chocolate pear tart recipes out there, and I'm guessing this one here would be one of the simplest. All you need is to whip up a batch of a cocoa batter/dough - a sort of cross between cake and almond cream -, spread it in a tart pan, arrange sliced pars on top, and wait for it to bake up nicely in the oven. If you baked this in a deeper pan, you might probably think it as being more of a cake than a tart, but I think this very rich batter benefits from being on a thin side. You can find the recipe here. This pear, chocolate and ricotta tart (recipe here) has a chocolate pastry filled with a ricotta cheese mixture studded with chopped chocolate, and topped with sliced pears and an almond crumble topping. Yes, there are a lot of parts to it, involving a rather more steps than I'm normally willing to take. But it was all worth it. I should note that, as I started with some of a homemade batch of ricotta cheese, I realized there wasn't enough of it for my needs; after a quick thinking, I supplemented it with some silken tofu, making it about half-half. Perhaps because I used a pretty mild-tasting kind of tofu, or perhaps there was a lot going on in the tart, but whatever the case, nobody tasted tofu when I served it. Phew! And then, there are spices. With a lot of the wintery spice and a smearing of marmalade, this gingerbread, pear and almond tart, whose recipe was found in donna hay magazine (Issue #63, 2012), whispers winter. Particularly when served with warm custard, which I took the trouble of making from scratch. Now, back to basics - with a twist. Pear and hazelnut tart. I started with a classic pear and almond cream tart, then swapped the almonds with hazelnuts, and replaced some of the flour with buckwheat flour for the crust. The result was a simple and rustic tart with a hint of something that makes you pause and wonder what it might be. I think I used a recipe from the Eric Kayser tart book, but can't be sure now (I made this a couple of years ago). What I do remember is that I brought this to a soba noodle lunch (buckwheat noodles expertly made from scratch!) where we all enjoyed it. In addition to these (and those I made and included in my autumn tart post), I've got a bunch more of pear tart recipes bookmarked - such as pear tart with walnut crust, chocolate tarts with mulled pears, and pear and cranberry rustic tart, among others. Alas, this winter my stock of pears ran out before I tried everything I wanted to try, so I'll have to wait until the next pear season rolls around. And another fruit that ran out on me? The quince. Inedibly hard but intoxicatingly aromatic, the fruit tends to spend a lot of time in our place, just so we can enjoy the scent - perhaps a little too long a time, even. They start popping up at local green markets at late autumn, but it is not until mid December or even later that I finally put it to some edible use. Which means, again, I often find myself out of time before I can try all the quince recipes I want to try. Oh well. Other than the one I mentioned in one of my past posts, I was shocked to realize that I've only tried one(!!) quince tart recipe over these last few winters. One! And that one, made in a somewhat haphazard manner too. Don't get me wrong, these quince and cranberry tarts were delicious by all odds - just not not the same thing as the original recipe has it. For starters, I used scraps of leftover pastry doughs from some other recipes (vanilla and cocoa). For the sherry-laced filling, the recipe uses ricotta, which I didn't have around; so I used cottage cheese (of a smooth type) instead. As for the compote, you are instructed to use dried cranberries, which I did have around, but chose to use a frozen kind, just because. And oh, I cooked the fruits with honey, not sugar. All these changes were subtle individually, but they could add up. So I don't know, my version was like a sort of the original tart in a parallel universe? Good thing it worked! There were a lot of recipes I wanted to try, but I knew exactly which one to try first. Ever since I first saw these 'sparkling cranberries', I'd dreamed of trying them out myself - now my dream was to come true! I checked out a few other recipes for sugared cranberries as well, and they slightly vary from one another. Some have you just soak the berries in a hot syrup, others require you to cook the berries a little, while some use spices, and so on. This time I wanted to use them for a tart, and settled on this recipe. Sugared cranberry and lemon curd tartlets. I didn't quite get the hang of rolling the berries in sugar perfectly, and they ended up being covered too thickly with sugar. But apart from that, they were fun to make and proved to be delightful little things, with the tart-sweet duo of sugared cranberries and lemon curd being tamed by cream cheese. Okay, let's talk about a flop now. This maple walnut cranberry tart seemed promising when I first thought of it. I wanted to try this gluten-free recipe but the filling looked better in this one, so I combined the two - a gf crust and a maple-walnut-cranberry filling. So far so good. The first misgiving I had came as soon as I started making the crust. This wasn't my first time trying a gluten-free tart crust, but it was my first time trying this particular recipe which makes use of rice and tapioca flours - both very starchy. Now ever since I was a kid, I've had a morbid aversion to touching starchy flours, such as potato and corn starches; mere a thought of that squeaky feel when you touch them makes me shudder. And as it turned out, cutting butter into the mixture of rice and tapioca flours by hand (I don't have a food processor) did JUST that. It was like a torture; I wanted to cry. I thought about dropping it, but persevered, only to be baffled by the dough that wouldn't come together. As a result of excessive kneading, the crust came out tasting like cardboard or rubber, not that I've ever actually eaten either. However you'd choose to describe it, one thing it definitely wasn't was delicious. I felt defeated. It was a pity because the filling, which I made using honey in place of corn syrup, was really rather nice. I couldn't face chucking the whole thing, so I ate just the filling, peeling off as much crust as I could. Oh well. Cheer up, me. And you know what cheers me up enormously in late November or early December? The first flurries of the season. They brighten up the otherwise all-brown scenery a little, turning the landscape into full-on winter. So let's get full-on wintery with tarts, too. Fancy an (almost) all-white tart on an (almost) all-white day? This aptly-named cranberry crackle tart, a cracking recipe from Baking Chez Moi: Recipes from My Paris Home to Your Home Anywhere by Dorie Greenspan (Rux Martin/Houghton Mifflin Harcourt, 2014), was a breeze to make and charming to look at, even though there wasn't much crackle going on with mine (I suspect I didn't mix the berries in the whipped egg whites thoroughly enough). I was in a hurry when taking pictures of the tart, and in my haste I sliced it before the tart was completely cooled - as a result, the slices got a bit of a mess as you can see in the picture. But when eaten completely cooled, it was delicious, more than making up for the messy look. You can find the recipe on Dorie's blog, here. By the way, I had a bit of the crust dough and the meringue mixture left after filling up the pan, so threw together a little tart. ...Which came out looking like a little ghost!!! Made me chuckle. Cranberry chocolate tarts. Okay, the tarts themselves have nothing to do with snow. but they looked pretty on a dusting of snow. Built on a crust made out of cocoa cookies, a mascarpone mixture as the filling, and ginger-flavored cranberry compote to finish it all, I think these tarts looked quite striking. You can find the recipe here. Other cranberry tart recipes I've bookmarked include cranberry, almond, and cinnamon tart, brown sugar-cranberry tart, cranberry-lime tart, and cranberry brie tart with thyme and pecans. Unlike pears, I've still got a lot of the berries left in the freezer, but just ran out of the time for the purpose of this blog post; so I think I'm going to try some of them, and at least I won't have to wait until their next season. Pomegranates! Well, they aren't really berries. In fact, not at all. But small, pretty, scarlet jewel-like things nonetheless. I've spotted pomegranates gleaming on the trees in people's front yards here in Nagano, but never seen the fruit actually sold at the green market. So the ones I get are imported - making them an exotic treat of a sort. Like a few other fruits I've covered in this post, the pomegranate may not strictly be a winter fruit, but is around at least mid winter, and is strongly associated with Christmas. So allow me to include it in this post. And oh, another thing: I can't remember when and where it was that I first had fresh pomegranates, but it was certainly not when I was a kid, and quite possibly not in Japan. Anyway, I've always eaten pomegranate 'seeds' (or more specifically, seeds with a "sarcotesta", or a seadcoat) in their entirety and never given much thought about it. But for the last month or two as I baked with the pomegranate and shared them with people at my folks' work as I always do, and also posted some photos of pomegranate-based sweets on Instagram, something came to my notice: Japanese people often don't eat pomegranate seeds. More precisely, they don't swallow the inner, 'real' seeds down but spit them out after they've tasted the juicy and sweet seadcoat part. I was taken aback a little when I first heard it, but judging by the number of Japanese people who told me about it, I'm in a minority here, as a member of a pomegranate seed eating camp. Anyway, about the tart; a graham cracker crust was filled with a white chocolate and cream filling and topped with fresh pomegranate seeds, a lot of it. It looked absolutely gorgeous thanks mostly to the ruby-red fruit, though the tart was a little too sweet for my taste, perhaps because of the filling; a fruit with little more acidity may work better with this particular filling, I should imagine, though this one was still really tasty. The recipe is here. The scarlet pomegranate seeds looked striking on white, but they looked absolutely stunning on dark brown. This dazzling, bejeweled piece was in essence a very simple affair; a chocolate pastry, a chocolatey filling, chocolate ganache, and pomegranate seeds. The single most unusual part of the tart would be the use of pomegranate seeds. As simple as it might be, there was not a single element that could potentially compromise the taste of the finished tart, and the result did not disappoint. Well, perhaps save for the blotchy surface of the ganache. But this pomegranate chocolate tart indeed was a show-stopper and went down a treat. You can find the recipe here. Enough with chocolate (for now)? How about pomegranate caramel tarts with walnuts? Pieces of puff pastry (store-bought) got topped with a mixture of caramel, pomegranate molasses, and walnut bits, then baked. Pomegranate seeds came at the very end, adorning the triangles of caramel-nut goodness. The original recipe is for a regular, large tart pan, which may as well work better than what I did here, as the caramel had a tendency of flooding and spreading out of the pastry. Still delicious though. I've never seen pomegranate molasses sold in Japan, but I can't be sure. Here I just cooked some pomegranate juice down to a thick syrup, and I think it did a trick. Loved the contrast between the rich caramel and juicy pomegranate seeds here! Now for the most part, recipes I've found for pomegranate tarts have you use the fruit uncooked; here's one exception. This berry pomegranate almond tart was another of those for which you don't need to make a crust separately. The addition of gritty cornmeal added the tart an interesting touch, and because I used rice flour in place of the wholewheat flour, it came out a little fragile and sandy (and totally gluten-free). And I should report that the pomegranate seeds were just as juicy and crunchy when baked in the batter! The recipe I used is here. A spot of tea while admiring the view? It is simply charming and enchanting, except that you wouldn't actually be able to sit out to enjoy the view; both the tea and you would be frozen before you can finish whatever you were eating. Here, we do it in the warm room, naturally. Once New Year holidays have come and gone, the availability of (decent) fresh fruits becomes even less promising - all except for citrus fruits. Blessed as we are with a wide variety of fresh produce all through summer and autumn, Nagano is simply too cold a place for most of citrus fruits to thrive in. That means citrus fruits of all kinds are inevitably shipped from somewhere warm, mostly the southwest of Japan, or abroad. But I simply LOVE citrus fruits and can't live without them; they literally shine out and brighten up the otherwise dim winter fresh fruit front. Every winter I would enjoy common varieties like the satsuma, yuzu, and kumquat that are available at local supermarkets in our small town. This winter, I took things up a notch and procured a bunch of different varieties, all hailing from the southwest. I tell you, it's been a citrus paradise this winter! Of all varieties of citrus fruits that grace the winter table, the one I prize the most I think is yuzu. I was always familiar with this long-treasured fruit, mostly as a garnish or seasoning for savory dishes when I was young, and increasingly more as a key ingredient in sweet things. This yuzu tart originates from lemon squares, one of my all-time favorite sweets. I came across a vegan version of a recipe some time ago, and made it using yuzu instead of lemon, in a tart pan. In the said recipe, the lemony filling is based on silken tofu in lieu of eggs. Flavor of tofu can be more prominent in some recipes than in others, and this recipe was one of those that wouldn't give away the fact that you used tofu unless you mentioned it. Because I used honey to sweeten the filling, I can't claim this was a vegan tart. But vegan or otherwise, it was delicious and a breeze to make, and I think I'll make it again, either with yuzu or lemons. As far as I can remember, lemons we had when I was a kid would be 100% imported. I remember being absolutely thrilled to find lemons grown in Japan for the first time, years ago - since then produce-of-Japan lemons have become more and more readily available at reasonable prices. Mayer lemons are a more recent addition to the market; I used to long for them in Japan, and my prayers have since been answered. I've been able to get Mayer lemons (imported, mind you) at my local grocery stores, and this year I even found online some grown in Japan. It's wonderful that more and more citrus fruits are being grown and marketed in Japan. I think I sometimes get carried away a little and end up buying a whole lot of something before deciding on what to do with them, like that time when I bought a large box of lemons not once but twice in one winter. I went on to make all kinds of things with all the lemon, about which I blogged about, including a few lemon tarts. Hope you don't mind me repeating myself on that account... and they are totally worth a double mention. ...Like this candied lemon tart. A sheet of (store-bought) puff pastry, sugared and baked, spread with a pillowy cream, and topped with slices of candied lemon. I used this recipe, replacing some of the heavy cream with mascarpone cheese, and used regular lemons rather than Meyers. Blueberry lemon cream tartlets. There was no particular recipe I followed; I just set about to use up leftovers, namely homemade lemon curd and gingersnap cookies. The former I folded into some mascarpone cheese (a regular in my fridge as you may have suspected by now based on its frequent appearances), while out of the latter I made a crust as you would with graham crackers. You might think blueberries might have been the star of the tarts as they sit atop in plain sight, but that wasn't the case; I just used some of the berries we'd picked and frozen earlier in the summer. The tarts were very decent with or without the berries. ...More or less, anyway. I made these bittersweet chocolate and lemon ganache tartlets with lemon sea salt inspired by a Latovian(!) bar of milk chocolate with lemon sea salt I'd bought at Salon du Chocolat Tokyo 2014. I more or less used this recipe, mostly for the chocolate filling, and finished the tarts with generous sprinkles of large-crystal lemon-flavored sea salt. As I waxed lyrical in the said lemon post of mine, I'd long been looking for a recipe for lemon tarts like Bonne Maman's, and this one, called tartest lemon tart from Dorie Greenspan's Baking: From My Home to Yours (Rux Martin/Houghton Mifflin Harcourt, 2006), may have been the best thing I've came across. making the use of fresh lemons in whole, these tarts were really tart, really sweet, and really very good. A dollop of whipped cream on the side wouldn't be amiss. Because I was after something like Bonne Maman lemon tartlets, I tended to make small tarts in my experiments. But Dorie's original recipe is for a large tart; so for my second batch, I made it in a larger pan. Although the tart got cracked spectacularly as I managed to drop the pan onto the floor (doh), the tart was delicious all the same. By the way, I had an occasion to eat the Bonne Maman lemon tartlets soon after I'd tried this recipe, for the first time in ages - and found them rather different from what I remembered them to be. I think I now prefer Dories'. Mmm, I wouldn't mind one of these right about now! The most extraordinary French lemon tart, featuring the most extraordinary lemon cream that Dorie learned from Pierre Herme himself. I went into great details about this silky and luscious cream in my lemon post, so here I just say this: this will blow your mind. You can find the lemon cream recipe here. The tarts were lovely with or without a mound of meringue on top. In fact, you could just have the cream without a crust and you wouldn't be sorry. That is to say, unless you are not afraid of how much butter that goes into it (hint: A LOT.). As a matter of fact, the amount of butter scared me enough to decide that this tart would be a special-occasion treat, and haven't made it again since. But recently something similar came to my notice that took my fancy pretty mightily. I recently bought a box of citrus fruits from a citrus farm in Wakayama, south of Kyoto and Osaka. As I mentioned, we've been seeing more and more citrus fruits grown in Japan, the kinds that we used to know only as imported - such as lemons and limes. But never did I even imagine they grew grapefruit in Japan, and I was astonished to find the said Wakayama farm did. I put my order in straight away, for pink and yellow kinds, along with a bunch of other things (including the Meyer lemons shown in some of the pictures here). And you know what? They tasted utterly, completely, perfectly like the grapefruit I'd always knew. And I was impressed for it. I don't know what I'd expected, but the knowledge that they now grow grapefruit as we know it here in Japan was rather gratifying. Anyhow, the first recipe that came to my mind the moment I knew I was to have the freshest grapefruit was a certain grapefruit cream. Or rather, a tart. I was introduced to this pink grapefruit tart by Dorie Greenspan, the one and same who shared with the world that extraordinary lemon cream mentioned above, in her latest book Baking Chez Moi. Consisting of a sweet tart crust, a lemony almond cream, and Campari-laced pink grapefruit cream and segments of fresh grapefruit, this was Dorie's take on the one they sell at the renowned Parisian pastry shop called Hugo & Victor. The grapefruit cream is made in much the same manner as that of the aforementioned lemon cream, except it is set with a small amount of gelatin (and, well, you use grapefruit rather than lemon). Because I finished it with a LOT of grapefruit segments, you can hardly see the cream in question until you cut into it. But it's there, gloriously sweet, tart and bitter all at the same time, and just as smooth and silky as its lemony cousin. I've been to Hugo & Victor in Paris, but haven't yet tried the namesake grapefruit tart, so I can't say how close this recipe is to the original. But one thing I can say is that this homemade version was an absolute gem. I'm pretty happy with it! I've made another grapefruit tart, a couple of years back. Grapefruit ginger tart. A sweet pastry dough, a mascarpone cheese dotted with chopped crystallized ginger, and grapefruit segments. I've seen quite a few recipes, for tart or otherwise, that pair grapefruit with ginger, and they are indeed a good match. This was a simple, straightforward and tasty one. You can find the recipe here. Blood oranges! I remember being enchanted by this striking looking fruit when I first came across them in Europe many years ago. They have since found their way to Japan and I would pick some up every now and then, but it is only the last few years that they really found their place in Japan as more farms start growing them in the country. When I first found made-in-Japan blood oranges (on the Internet), I positively went overboard and got myself a large box of them. And before I knew it, a lot of them disappeared as a morning and afternoon snack, before I could bake much with them! 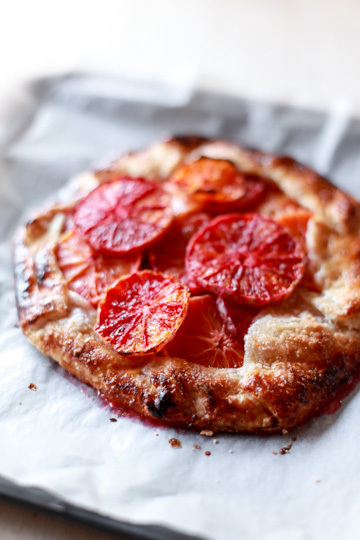 This blood orange galette was one of the few things I managed to bake before the box got completely empty. I managed to let it overbaked a little (sigh), but isn't it just gorgeous? The tart in itself is nothing more than a simple combination of a buttery, flaky pastry and juicy, sweet orange slices. And it's marvelous how a simple combination can produce. The recipe suggests you serve the tart with a salted caramel, and that's what I did. The tart was delicious on its own, but the pleasantly bitter, salty, and sweet sauce gave it additional layers of flavor, bringing out the bright flavor of the orange. Chocolate roasted orange tart. Slices of blood oranges oven-baked in orange juice adorn an orange-flavored mascarpone mixture in a cocoa crust. I think I (again) overbaked the orange slices a bit, making them a bit tough - but not so far as to ruin the whole tart. Phew. And the colors! I could have looked at it forever. Well, almost. You can find the recipe here. While blood oranges are seeing their domestic production expanding in recent years, we are also seeing other types of orange grown in Japan now more than ever, including common kinds such as Navels and Valencias, both of which are still mostly imported. I was really excited to get these Navel oranges from Kagawa, on Shikoku island down southwest. With their leaves on! You'd be able to imagine how giddy this made me with joy, if you lived in Japan and spent some time shopping for fresh produce; you'd know how rare it is for you to find fresh fruits, citrus or otherwise, that come with leaves still on. Pity, I know.! I'd prepared a tart dough before my oranges arrived, and proceeded straight on to make it as soon as they did. This simple orange tart is in a way like an upside-down cake. You sprinkle sugar on the bottom of a pan, arrange orange slices, dot with small pieces of butter, then cover with a piece of rolled out dough that's basically a simple mixture of sugar, butter, flour, etc. Based on the original recipe (*note: as of the end of February, the website is undergoing a major re-designing and the recipe page I found is not there at the moment; will update the link when it's back up again), I replaced some of the flour with whole wheat flour and ground almonds, and half the butter with olive oil. A sweet, sturdy, and flavorful affair. Fresh orange and yogurt tart. It is originally made using Navels alone, but when I found this recipe, I thought: how pretty it would be if I made this with oranges in not one not two but three or more colors? The tart itself is a pretty simple thing, with an almond-packed crust filled with Greek-style yogurt, very lightly sweetened and set with a bit of gelatin. And on top of it, come rounds (or haphazard rounds) of fresh oranges in three colors. Along with the dark red blood orange and bright orange Navels, I wanted to add something sun-kissed yellow, and settled on a one called Haruka, a lightly sweet variety related to Hyuganatsu. I should probably admit that this isn't a variety you eat with membranes on, thus not really suited to the use like this one here. But I used them anyway, if nothing else for the sake of color, and of course, flavor. Since the filling is basically just Greek-style yogurt with a bit of (brown) sugar and cream, it was rich without being overly indulgent. I love yogurt, I love oranges, and I love them together, too - so this was a kind of tart perfect for me. And isn't this tart just GORGEOUS? I think I might make it again while I've got a whole lot of citrus fruits lying around. For the topping, from top to bottom: segments of blood oranges, pink grapefruit, Shiranuhi mandarin orange (more commonly known as Dekopon), and yellow grapefruit. For the tarts, I made vegan tart shells and 'custard'. The recipes for the crust and custard were from かんたんお菓子 ('Simple Treats') (Wave Publishers, 2012), a Japanese baking book written by cooking instructor and author Hiroko Shirasaki; some of you might remember it from my autumn tart post as I turned to the book over and over again. The vegan 'custard' made using rapeseed oil and soy milk in place of eggs and dairy, is by no means the same as the traditionally-made stuff, but it is tasty on its own and we enjoy it very much around here. My plan was to mix and match the citrus fruits for each mini tart, but I changed my mind halfway and instead made four kinds of single-citrus tartlets. So here are vegan two-bite citrus fruit tartlets, which may present themselves rather well if you make an army of them for a party of something. As it was, I only made five(!) of them, and they disappeared in a flash. Now I may seem to have been going gaga over all the not-traditionally-Japanese-but-now-increasingly-common kinds of citrus fruits, but I do embrace the traditional bunch just as much. Satsuma mandarins are THE citrus fruit of winter when I was a kid. We'd buy them in large boxes over the winter, and consume them in copious amount in one sitting, most often at kotatsu. Why, the combination of the two, namely "kotatsu de mikan (satsumas at kotatsu)" is considered as the epitome of the way Japanese people used to spend cold days at home in good old days. Now, satsumas are usually eaten as is, as a snack; if you want to use them for dessert, you'd usually pick up a tinned kind, which now seems to exist solely for the nostalgia's sake. And truth be told, satsumas can be a bit too bland when baked. But I wanted to try and bake with real, fresh satsumas, and this is what I came up with: satsuma orange galette with ginger. I started with this recipe, swapping the blood orange for satsumas and adding a handful of crystallized ginger, to add a little zing. As is the case with all fruits in general that are around in Japan, satsumas are getting sweeter and sweeter, and less and less acidic. But the ones I used here happened to be both sweet and pleasantly tart, so they worked perfectly in the tart. Bourbon-chocolate kumquat tartlets. The tart part was again based on recipes from Simple Treats by Hiroko Shirasaki, a cocoa crust filled with vegan 'chocolate custard'. I topped them with kumquat halves poached with honey and bourbon whiskey (which I added to the custard as well). I wondered if they might have gone with Bourbon and chocolate better if the kumquats had been cooked with maple syrup rather than honey, but these tarts were still pretty fine. I just wished I'd used a bit more Bourbon, but these were to end up as my folks' work treat, so I held back. I used to cook kumquats almost always even when I had them simply as a snack, but I've been eating them uncooked more and more these days, thanks partly to the newer, larger and sweeter varieties that are around. And these fresh kumquat tarts with almond-date crust are the tarts I made using some of those large and sweet kumquats. Of course kumquats were the star of the creation, but secretly I was more excited with the crust; it was fun to see some almonds, dates, and rolled oats (plus a bit of ground cardamom and salt) form into a dough in a blender (you ought to use a food processor, but I used my decently powerful blender with no problem). The recipe is here. The filling is Greek-style yogurt that's been farther drained of liquid, making an extra thick, creamy yogurt. On the whole, we were really happy with the tarts and I'd be happy to make them again, with kumquats or some other fruits - if I can get a hold of dates on the cheap (they are rather on the expensive side in Japan). Bright green limes. They also are now available grown-in-Japan, though the ones I had here weren't. And the first tarts I made with limes were dainty little things, though each with quite a kick to it..
And the name says it all: smoothest, silkiest, creamiest, tartest lime tart(lets), and it's all down to the lime filling. Very similar to the lemon and grapefruits versions I've already made, this one's also by Dorie Greenspan, in her latest masterpiece Baking Chez Moi. In a nod to the great American classic that is Key lime pies, Dorie notes that you can finish the tart with sour cream, and even make the crust with graham crackers rather than the sweet pastry dough. I followed the second suggestion. I used a mini muffin pan to make really small tartlets - each one sweet and smooth like a dream, and yet sharp enough to wake you up! ...That is, if the freezing winter morning failed to do the trick. One mid February morning, past eight in the morning. It was freezing. Literally. Streusel-topped rhubarb lime tart. The streusel topping, filling, and rhubarb are all flavored with lime, and the accumulated effects were quite distinctive. If you've already got an early-season crop of rhubarb, or got some stashed away in the freezer like I do, this is a delightful thing to make now - it seems to fit in both the winter cold and the early spring warmth. This also happens to be from Dorie Greenspan's Baking Chez Moi. It's been years now since strawberries turned more or less into a winter fruit in Japan. As I lamented before, they now make their appearances at supermarkets in late autumn, sometimes as early as October. Yes, you read it right: October. February and March is considered to be late season for strawberries. Meanwhile, as far as mountainous Nagano where I am is concerned, locally-grown kinds stick around until June or July, sometimes even later - so altogether, you can find strawberries almost all year around. That's kind of sad, if you ask me. Despite such a little sentiment, I am not immune to the pretty red berries proudly occupying the store shelves, and I do buy them every now and then even in the winter. So here are some winter-like strawberry tarts I've made in the last few years. Strawberry ginger tart. A ginger-flavored crust coated with a thin layer of milk chocolate, filled with a cream cheese mixture, then topped with fresh strawberries along with chopped crystallized ginger. An addition of ginger can give just about everything a flavor of winter, don't you think? The recipe is from here. If I am completely honest with you, this tart didn't taste as great as I'd hoped it to be - whether it was because of the recipe itself or my execution thereof, I don't know. But it most definitely looked extremely pretty, and I ended up taking too many photos of it. I think I'll make something similar again in spring, changing up the crust and filling (i.e. basically everything), topped with a mound of fresh red strawberries. Now, did you know not all strawberries are red? Some years ago when I first heard about a kind of strawberries that are snow white with bright red seeds, with a flavor reminiscent of pineapple, called the pineberry, I wasn't particularly impressed. I consider myself to be curious about all sort of new-to-me fruits and varieties, but these eerily white berries simply didn't look very appetizing to me. I hadn't given it much thought until very recently, when an Australian blogger/Instagrammer friend of mine visiting Japan expressed an interest in this white strawberry tart that was about to appear at a Japanese pastry shop chain dedicated to tarts. As we chatted about it a little, and I also spotted some white strawberries at some of the upscale fruit shops and department stores, I was grew more and more curious about them - enough to give in eventually and decide to try them myself. I should now note that these white strawberries we now have in Japan are probably not the same as pineberries; for one thing, these aren't completely white but often have a blush of pale pink. Whatever the case may be, they are still a rarity at the moment, and those I saw at the shops in Tokyo all came with a staggering price. I looked for a bargain online, and I did find something a little less outrageous - still far from affordable I'm afraid. Now the precious few punnets of berries that arrived looked just as odd and underripe as pineberries did when I first saw them. Even though everyone, marketers among others, claimed that they were sweet and not at all tart, I couldn't quite believe it until I actually had the first bite. They were, quite counterintuitively, really rather sweet and not tart, like, at all; in fact, I would have liked them better with a little more tartness. And smelled wonderful. A simple white strawberry tart. No recipe here, just a sweet shortcrust pastry, smeared with a bit of peach jam, filled with a mascarpone-based cream, and a lot of fresh white strawberries. And when i said 'a lot', I meant it. Seriously. As I said, the white strawberries smelled really sweet, so when you had a large heap of them like I did here, the tart smelled absolutely lovely. As for the taste... well, I'm hesitant to admit it considering how much the berries cost me, but it was a little bland. So there. I mean, it was good, but just wasn't great. I think it was because of the the white berries' lack in acidity. So on a whim, I made a few little tarts using the extra pastry dough and filling I had, now with a mixture of red and white strawberries. And to my delight, these red and white strawberry tarts struck just the right sweet-tart balance! Looked pretty too. Then again, I wasn't ready to give up on them completely so quick, and tried something else. White strawberry and lime cream tartlets. To make up for the want of tartness in the white strawberries, I opted for a more tart filling, and settled on a mixture of cream cheese and heavy cream, lightly sweetened and generously flavored with the lime, an ingredient that goes really well with strawberries. I loosely followed this recipe; the idea of using scones as tart crust sounded both fun and ingenious, and I had to give it a go! Too bad I can't remember which scone dough recipe I actually used - a cream cheese-based one, pretty straightforward. The pleasant tang in the cream cheese mixture and the zing of lime worked well with the very-sweet-and-not-very-tart white strawberries, I think. Even if just a hint. So that's it for my winter fruit tarts. A total of about 40 of them made over the course of three winters. Not as many as those I made for the autumn post (which was unreasonably massive), but still quite a lot I think. As a matter of fact, quite a lot more than I'd thought I would make, what with a lack of seasonal fruits and all. I think citrus fruits saved the day. Or season. I've still a lot of them, so there will be more citrus treats in the house, tarts or otherwise. Prune and Armagnac tart. A marriage of custardy filling and soft dried prunes, bonded by the smooth and aromatic Armagnac brandy. The combination of Armagnac and prunes is a classic one, and you can find tarts such as this one a lot, especially in France. The recipe I used here was from A Year in My Kitchen by Skye Gyngell (Quadrille Publishing, 2006). I was rather shocked just now to realize it came out nearly ten years ago, but to this day it's one of the books I still turn to a lot. This was one of the recipes I bookmarked very early on, and I don't know what took me this long... but here I finally put it to action. You can find the recipe here, too. I like prunes, so it was not surprising to me that I liked the tart very much. But even my mother, who isn't keen on prunes, raved about it. I also found it tasting even better on the second day, something that's not so common with tarts in general. As I've said repeatedly, I didn't expect to have a lot of fresh fruits to bake with during winter, and imagined I'd be making tarts mostly with dried fruits, like this one. But since I actually had my hands full with fresh fruits as it turned out, this was pretty much the only dried fruit tart I've made in these last few winters. I love dried fruits, so it's a bit pity... but I think I shouldn't complain here. It is going to be a while before it finally starts feeling really like spring around here, but the end of winter is definitely in sight as the days are getting longer, nights are getting less frigid, and the snow is melting away faster, exposing the brown earth that's been covered entirely for the last few months. I think I'm ready to start making springlike tarts. Again, thanks SO much if you've endured yet another intolerably long post and made it this far... hope it has something that may give you ideas for when the next winter rolls around. I do sincerely hope I'll do better with my spring tart post...! Chika, I just found your blog and I must say it is gorgeous, every last picture and word of it! In particular long posts such as these -- I could gaze at them for hours. I actually came here looking for a post about white strawberries and was pleasantly surprised to find so much more. It is wonderful to read that you are able to use what you can from your region to make just about anything under the sun (or moon, depending on when you may do some of your baking!). Thank you so much for sharing all that you have here. I look forward to your posts in the future! I have just dropped in by chance, and my eyes are still reeling from the visual feast of your post. All that in a single post?! A book wouldn't be enough to do justice to those photos! As a former food blogger, my mind is boggled. (I'm a boggled blogger). Seriously, wow. Sue Teen, Claire - i DO taste everything i make but i give away most of them, most of the time. Wow ... what a beautiful frut tart and looks yummy. And yet another "Oh, my!" I chanced to see the lime & white strawberry tart - a thing of great beauty - while foraging for lime recipes. I, too, read every word, gazed longingly at every picture-perfect picture (sorry about that). You are a marvel and I thank you form the bottom of my heart and my stomach and I'll be looking forward to your next post...the longer and more picture-strewn the better. It is a rare pleasure to find someone so articulate in what (I will rashly assume) is your second language. hi kane, thanks very much... much too kind!